Amidst the clamor of the Ballard Locks – loudspeakers blaring, trains rumbling, bells ringing, visitors shouting, and sea lions barking as they scoop up migrating salmon – you may catch the sound of an avian squawk. 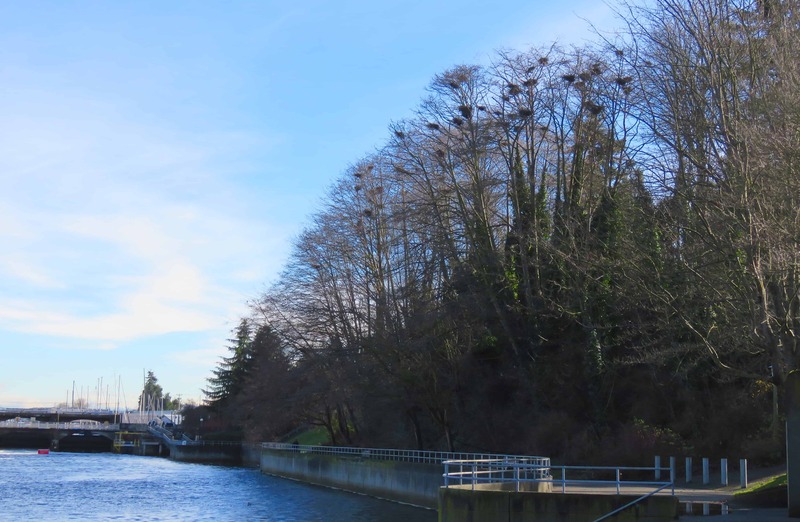 Looking closer, into a canal-side grove of red alders, you may spot a cluster of nests dotting the treetops. 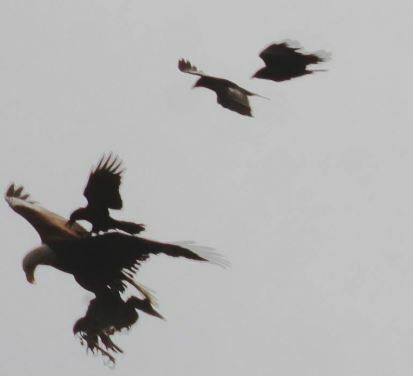 Huge birds swoop by, dodging the advances of noisy humans and hungry eagles as they curl into their nests. Welcome to the home of Seattle’s largest colony of its official city bird, the Great Blue Heron. Commodore Park, a 3.9-acre public park on the Magnolia side of the locks, seems an unlikely place for these gracefully gawky birds to nest. But there is a story behind the colony, a story of ecological interconnectedness that spans generations of development, predation, and conservation. To learn this story, I spent a drizzly afternoon catching up with Mike Marsh, Debbie Jacobsen, Marla Master, and Linda Marsh, members of a volunteer organization called Heron Habitat Helpers. Heidi Carpine and Donna Kostka founded Heron Habitat Helpers (HHH) in 2001 with a mission to protect heron habitat. HHH’s roots, however, go back to the 1960s, in a forested park called Kiwanis Ravine. In typical postwar housing fashion, a developer planned to populate the ravine with condominiums. Concerned about the project’s ecological impact, Carpine assembled a neighborhood group that pushed back and eventually thwarted the development. Decades later, in 2001, nearby development again threatened Kiwanis Ravine. By this point, the park had become an important heron nesting ground in the growing city. So Carpine again took action, this time joining forces with Kostka to form HHH. Since its inception, HHH has worked hard to preserve heron habitat through both direct restoration work and political involvement. In 2003, HHH finished a Seattle Parks-approved management and monitoring plan for Kiwanis Ravine, and officially kicked off its habitat restoration projects. 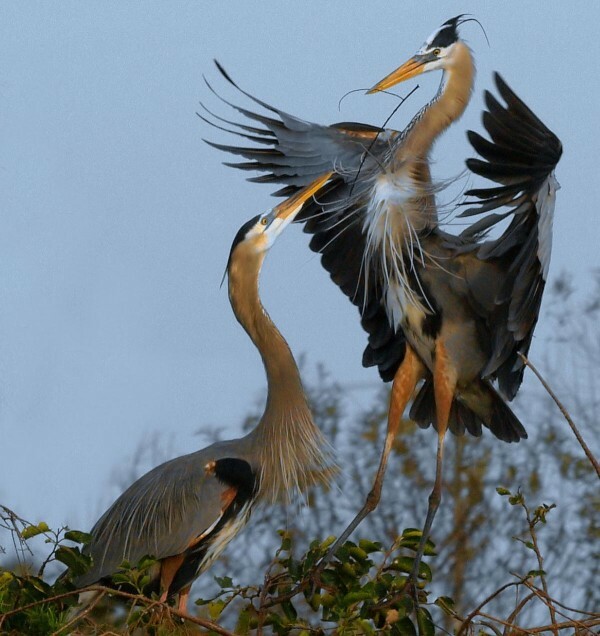 In 2007-8, HHH successfully advocated for heron nest protection (via Director’s Rule 5-2007) and $600,000 in Parks funding for Kiwanis Ravine habitat restoration. In 2010, HHH received the Denny Award, Seattle Parks’ highest conservation award, and saw Kiwanis Ravine designated as Seattle’s first Wildlife Sanctuary. Seattle’s herons had their home. Bald eagle taking a young heron. Photo by Kathleen Atkins. colony’s young herons. Despite years of work to protect the ravine from human disturbance, the hungry eagles quickly made it an inhospitable abode. The herons soon spirited away from their bloodstained nesting grounds and found their way to Commodore Park. Commodore Park, meanwhile, is relatively safe from eagles. It seems that eagles are a bit more timid than the herons when it comes to the noises and human disturbances of a more urban park. Moreover, the herons have benefited from an osprey that nests near the herons and drives off eagles to protect its own young. “We have an osprey for a partner,” jokes Jacobsen. In addition to a raptorial security guard, the heron colony has a healthy grove of red alder trees (which are able to withstand the massive amounts of nitrogen that the birds deposit in their droppings) with easy access to the requisite shallow, fish-bearing water. The colony also has a staging area – on an old fuel dock – where male birds preen their plumage and dance around in hopes of attracting a mate. Perhaps most importantly, the colony also has a dedicated team of volunteers working on their behalf. Despite being what Marla Master describes as “a 100 percent all-volunteer group – we even buy our own coffee!”, HHH maintains a robust monitoring program. Monitoring volunteers, who include HHH’s directors, PhD researchers, and middle-schoolers collecting service hours, visit the park every three days. They carefully follow prescribed methods, including a system of letters and numbers corresponding to trees and nests that allows HHH to keep track locations and activity. Because of this diligent monitoring, we now have a detailed picture of how the Commodore colony has changed over the last few years. Between 2014 and 2016, the annual number of active nests hovered around 60. This year, however, it has dropped to 40. HHH members do not have an easy explanation for the decline, but have noted unique occurrences this season such as the most winter precipitation on record, the running of particularly noisy equipment during the herons’ crucial pre-nesting stage, and a sewage runoff event. “We’re always thinking about variables,” says Jacobsen. HHH does not just monitor; it also takes the action of restoring heron habitat and trying to increase the number of active nests. HHH works directly at four sites – three in Kiwanis Ravine and one in Commodore Park. The Kiwanis restoration projects are older, and have transformed sites from invasive species tangles to well-established forests with good wildlife corridor value. Thanks in part to this work, cougars, bears, and deer have recently showed up in nearby Discovery Park. The newer site falls along Commodore Park’s shoreline near the train bridge. 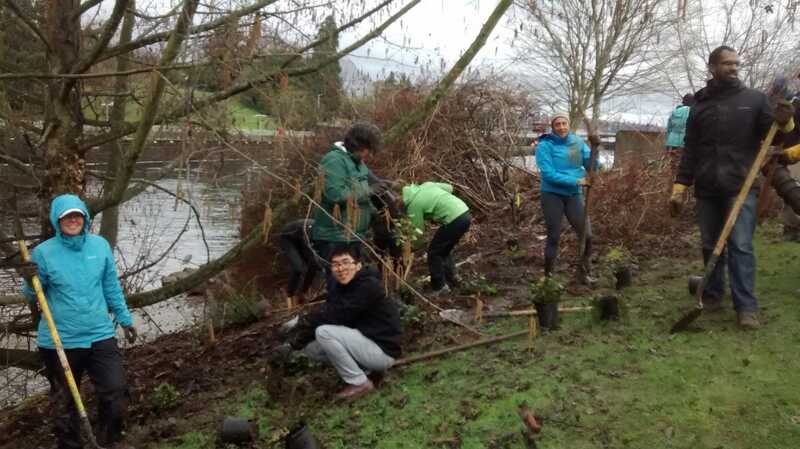 Several work parties at Commodore have sheet mulched and planted, and an EarthCorps crew, funded by Seattle Parks, removed ivy from the trees where herons nest. HHH hosts volunteer work parties regularly at all of its restoration sites, from small community sessions to large corporate groups on national days of service. HHH has a strong partner in Seattle Parks. 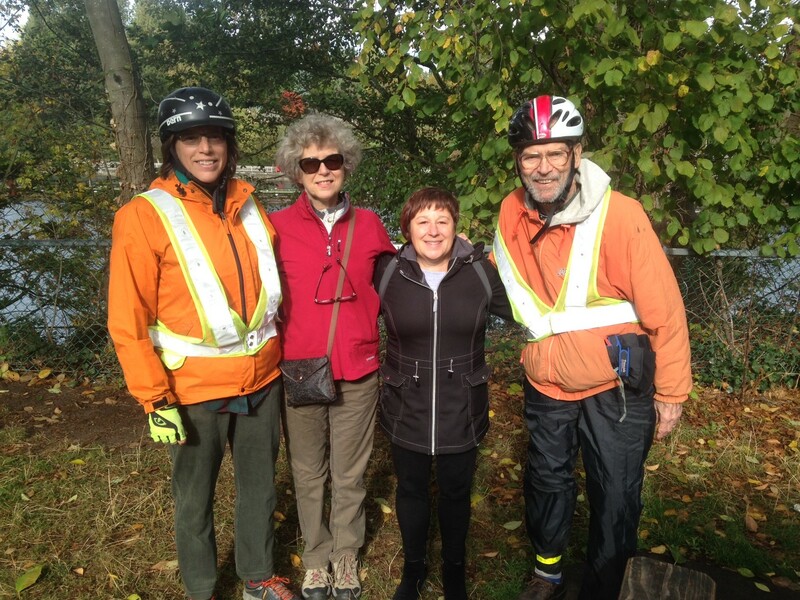 When areas are too step or wet for volunteers to safely work in – conditions that describe much of Kiwanis Ravine – the department hires professional contractors. Parks also pays for the plants used to revegetate sites, including a major planting project at Commodore to be completed by the end of this year. While HHH drums up the will to protect herons, Parks is crucial in providing the funds. 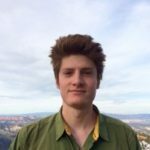 HHH’s story makes clear the interconnectedness of urban ecology. As pressures across the city and region constrain the natural behaviors of certain species, they adapt – whether to bonier food sources or noisier homes. All the while, Seattleites play a crucial role in preserving and restoring the habitat that gives these creatures a chance. Restoration work, by Green Seattle Partnership, HHH, and others, makes this city a place where humans can be positive players in the ecological web. According to Mike Marsh, HHH “expand[s] Green Seattle Partnership…we’re showing how the vegetation is important to the rest of the ecology.” Pulling ivy and planting shrubs assume a deeper significance when we see that doing so saves heron nests and creates wildlife corridors. What we stand to gain from restoration, however, is not limited to animals. “I tend to think that if it’s not supporting wildlife, there’s something missing for us as well, not just the wildlife,” says Linda Marsh. From left: Linda Marsh, Debbie Jacobsen, Marla Master, and Mike Marsh. Interested in joining Heron Habitat Helpers? The group is always looking for volunteer monitors, administrators, stewards, and more. Visit www.heronhelpers.org/volunteer/ or reach out to info@heronhelpers.org to find an opportunity that works for you!